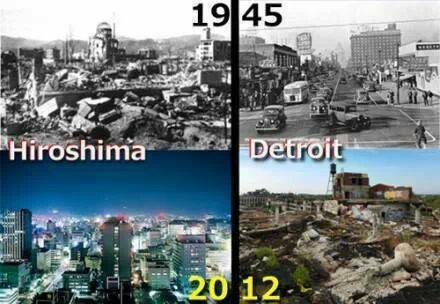 How are we going to fix the world when we can’t even fix Detroit??? It’s a rough couple weeks here in my part of Brooklyn. My beloved computer gave up the ghost, doing serious damage to the hard drive when a virus clean went awry. An amazing (and non-data related) physical viral infection came down on our heads like an avenging angel, withering everyone in the household for days on end. I’d say more, but one can never challenge worse (as in ‘well, things can’t get worse’). About my new computer, I must point you here, since most of what I have to say about Windows 8 is said more completely on the YouTube. I would merely point out that Microsoft’s latest, almost irretrievably bad operating system, exists as Exhibit A in the James Howard Kunstler thesis that we are seeing the dismal diminishing returns of technology. How I miss my old XP machine. Anyway, Occupy Wall Street is gearing up for its second anniversary in a week or thereabouts, and I expect to be doing a certain play there in days to come. It looks like it will be at Zuccotti Park, It looks like I’ll be doing it more than once, It also looks like there will be marches and lots of activity. Funny thing about Occupy–if things had continued to get even slightly better, the eulogies would have rung true. But with the Nobel Laureate guy flexing those Tomahawk missiles in the direction of Damascus, the conventional wisdom is all on its head. Somebody wanted to protest, and Occupy is still the only game in town. By the way–At a million or so per copy, one would think that selling off a few dozen Tomahawks for scrap might be a smarter deal than just blowing them up, since we apparently can’t keep what was once a major American city from falling into the kind of dissolution that used to be the province of saturation bombing or worse.